Lifetime Free Credit Card offer really worth to avail? Home » Credit Card » Lifetime Free Credit Card offer really worth to avail? Before one year I got a lifetime free credit card offer from SBI. The offer was very lucrative. No joining fee, No annual fee it’s all free. I checked all the documents, terms and condition, interest rates and soon decided to take this offer. After submission of relevant documents, “SBI Gold Credit Card” was handed over to me. I was really happy to get this plastic card. For initial few days, I used this card. However, after some time, it was lying without any usage. After one year I got an annual statement with a surprise that my annual fee for the credit card is due. I immediately contacted SBI credit card helpline; I asked them that credit card was taken as Lifetime free with no annual fees. How is an annual fee being charged after 1 year? Customer care executive has given an answer that it was specified in terms and condition that “Customer needs to spend minimum 24,000 Rs per year using a credit card to waive off second-year annual fees”. As you have not spent minimum amount annual charge is applicable to you. I had no option but to make payment of annual fees as it was my mistake. This credit card blunder has taught me a lesson for the lifetime. I could have thought it earlier that “There is no free lunch in this world”. Everything is charged or bundled with hidden charges. One needs to read every Terms and Condition including terms with small letters with asterisk * sign. If you have got an offer of lifetime free credit card or if you are planning to take a credit card with no annual fees here are important traps you must be aware of before availing such offers. Most of the credit card companies will waive off your annual fee only if you spend a certain amount in a year. Check terms and condition carefully before availing any offer. Apart from joining fees and annual fees some other hidden fees are also charged by some credit card companies. You must be aware of such fees. Low interest offered on lifetime free credit card is a trap to lure you for easy access to money. The executive is not willing to give terms and conditions. Lack of contact information in the brochure. These cards are good if you spend within the limit or pay your credit card bill on time. A credit card should be available with low-interest rate. Lower the interest rate means better the credit card. Interest rate matters a lot when you laps due date of payment or default. The interest-free credit period varies from 15 days to 45 days and depends on upon credit card companies. Higher the interest-free period means better the credit card. Credit card companies apply late payment fees when you default or cross interest-free period. Lower the late payment fees means better is the credit card. Rewards offered by credit card companies and method to availing it matters a lot. Choose a credit card which offers more reward point on every transaction. A credit card should be available with no extra cost or hidden charges. 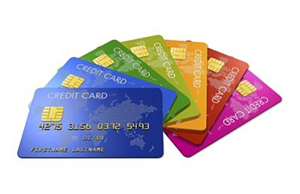 You should check applicable charges carefully before availing credit card offer. 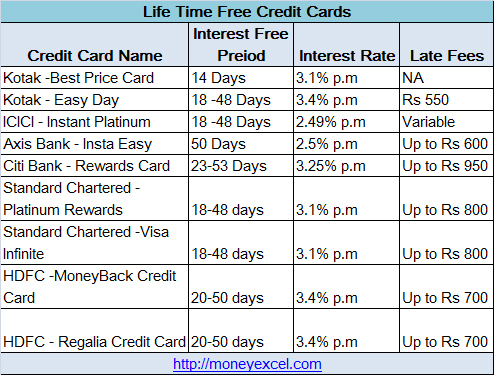 Here is a list of Life Time Free Credit cards available in the market. What is your experience with Lifetime Free Credit card offer? Do you think these credit card offer are worth to avail? Do you know any better Lifetime Credit cards? Do share details in a comment section. The credit cards in India are ripping off consumers big time. I hope we will have tighter regulation for credit cards in India just like IRDA is controlling insurance companies.